​​Back with league play, drop in nights, and of course bonspiels! Join us at the Viewpoint Lounge for Pizza Night to recognize our valued volunteers! As the 2018/19 season comes to an end, we'd like to extend our appreciation to the curlers, volunteers, staff and of course- our Ice Maker, Roger! New to the Sylvan rink, boasting 22 years of ice making experience, Roger has been able to fine tune and offer the ice consistency we all enjoyed this season. Changing the airflow pattern and addressing the Brine were a few major components to this success. Years of maintaining multiple rinks in the Edmonton area, Roger, his 2 siblings, father and uncle were responsible for the ice making. It's safe to say it runs in the family! As we continue to grow the club, further improvements are coming for next season including new scoreboards and curtains. Thank you to all for a great season. Enjoy the summer and let's hurry hard again in the fall!! Our Bonspiels were a success this season. Click on the Bonspiel tab to see the winners!! ​Door prizes, live music and a cask beer competition. There are still many options available for both businesses and individuals to sponsor and donate to the NexSource Centre. 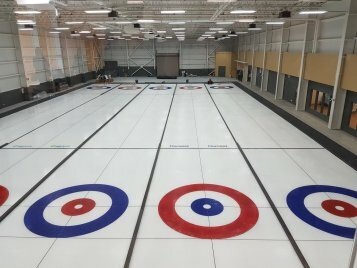 This includes naming rights for the curling rink and individual sheet sponsorships! Come visit us in the Viewpoint lounge where you can have a bite to eat and a beverage while watching hockey on one side and curling on the other while staying warm! !